She is currently working on two book projects. The first, titled Vernacular Ethics, is a theoretically re-framed collection of her ethnographically-grounded essays on various topics in ‘lived ethics.’ The essays range from religious programming in modern Indian television to the resonance of Gandhi in everyday life, from an alternative praxis of the public to the temporal dimensions of the idea of diaspora. Engaging the interdisciplinary theorization of the vernacular, she suggests that all ethical praxis is inevitably vernacular, and that this very vernacularity creates the possibility of a transcultural language of ethics. Leela’s second monograph (in progress), titled Annotating Pastimes, is located at the intersection of religion and the history of anthropology in India viewed through the perspective of three Indian folktale collectors in colonial India (for sample of this work, see here). The wide-ranging writings of these scholars and their extraordinary but obscured biographies that have acquired new life through the memories of living descendants demands that we re-appraise “enchantment” as a critical mode of engaging the past (collective, individual) and as a creative strategy for critiquing the political present. The book’s central argument is that without engaging enchantment, the theorization of Hindu life is ahistorical, even lifeless. A key area of Leela's interest is documentary film. She is currently co-directing an ethnographic documentary film called Moved by Gandhi that explores the Gandhi, not of the well-known chronologized biography, but of an affective presence that has outlived its historicity and simply moves people to be one way or the other. 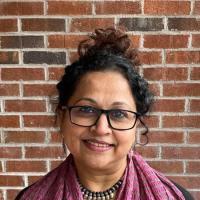 Leela's work typically combines ethnography and ‘textual’ study to understand the dialogue and distinctions between early Indic constructs and modern formulations, such as “shastra” (or law, rules of conduct). But she has also begun to explore the potential of modern science, especially physics, as she probes an anthropology of ethics. Leela is fluent in the Indian languages of Telugu, Kannada, Marathi, and Hindi. She was the inaugural director for the Duke Center of Civic Engagement, served on the Board of the Center for Documentary Studies for many years, and serves on the steering committee of the university-wide Mellon-funded transformative humanities initiative at Duke called Humanities Writ Large. Leela Prasad & Baba Prasad. Moved by Gandhi [A documentary film]. 2015. Prasad, LEELA. "Hinduism in South India." Hinduism in the Modern World.. New York: Routledge, 2015, 15-30. Prasad, LEELA. "Cordelia’s Salt: Interspatial Reading of Indic Filial-Love Stories." Oral Tradition 29:2 (2015): 245-270.